Friends, family and pupils of Oswestry School enjoyed a fun filled Christmas Fair on the 15th December which helped to raise money for local charity The Charlotte Hartey foundation. The event was opened by Charlotte's older brother Tristan who was previously a pupil at the school. The total sum raised was over £600.00 in what proved to be a joyful and festive occasion. Charlotte's family and friends would like to give a very big thank you to all who helped to make this year's Christmas Fair such a success and for the donations given to foundation. The final score was 6-2 to the 1st school team. It was a great match full of excitement and both teams thoroughly enjoyed the match. Neither team had a fixed goalkeeper, which allowed opportunities to score. During the full 70 minutes there were a lot of great tackles were made and some fantastic goals scored by both sides. 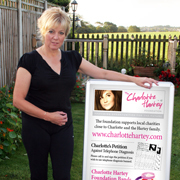 Despite the cold and blustery weather the match was well supported by generous spectators and in total managed to raise £85.20 from donations and the sale of the Charlotte Hartey Bands. We would like to thank you all for attending, playing and most importantly... donating to the foundation. 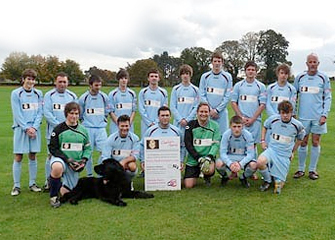 The Charlotte Hartey Foundation football match was a fun fuelled afternoon resulting in a resounding win for the Oswestry School 1st XI football team. 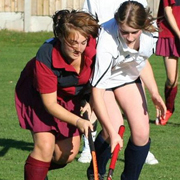 The match took place on the Oswestry School Pitch on the Wednesday 21st October at 4.15pm. After 90 minutes of nail biting challenges and near misses the foundation lost by 7 goals to 1. This is the beginning for the foundations sporting challenges – A rematch is being planned already! And, for the girls... a netball match for the New Year! The event raised a brilliant grand sum of £432.65p from donations and foundation wristband purchases from the supporting spectators. We would like to thank you all for attending, playing and most importantly... donating to the foundation. 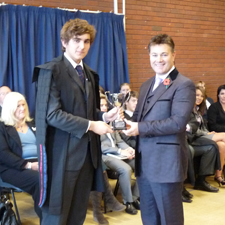 Pictured left: Karl Hartey presenting the Winning Trophy to the school Team Captain. Christine Evans, the wife of Applewood's Estate Planner Bill Evans,has raised 0ver £300 by completing a Half-Marathon. The event took place in Windsor on Sunday, 27th September 2009. 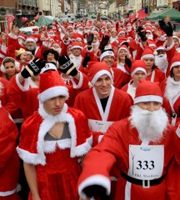 Hundreds of Father Christmas look-a likes descended on a Mid Wales town on Sunday 29th November 2009 to take part in an annual Santa Run. The "Mitchell Girls", Kelly, Shelly and Louise braved the elements to raise over £150 for the Charlotte Hartey Foundation. Louise completed the run in 55 minutes. We thank you kindly for your donation. 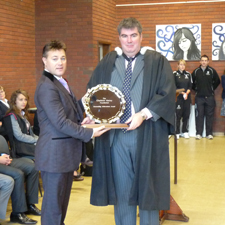 Karl Hartey presented Oswestry School with a Silver Salve. The Schools headmaster Mr Douglas Robb said "he was honoured to receive the Salve and will take great pleasure in presenting the award to the most deserving pupil at the end of year ceremonies"
Charlotte was a pupil at Oswestry School for 4 years where she excelled at her studies.